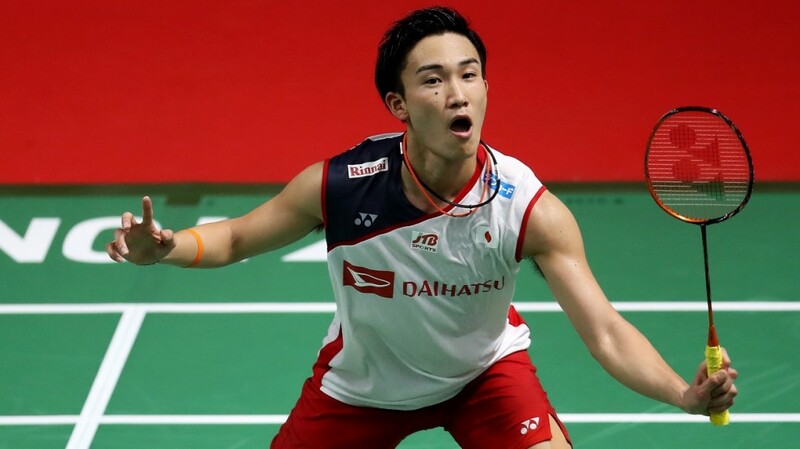 A masterclass by Kento Momota saw him outplay local hope Anthony Ginting – one of the few players to have troubled him in recent times – to enter the semifinals of the DAIHATSU Indonesia Masters today. Ginting had stopped the world champion’s campaign at the Asian Games at the Istora Senayan last August, but today the Japanese kept him on such a tight leash that the speedy Indonesian was made to look out of his league. So tight was Momota’s control that Ginting wasn’t allowed to impose his pace; Momota had the shuttle on a string at the net, and kept his opponent off-centre with precise flicks to the corners. The 21-9 21-10 result was the most one-sided of the nine matches between the two. In the semifinals, Momota takes on Denmark’s Viktor Axelsen, who will be up against an unenviable career record against the Japanese. Axelsen has beaten Momota only once in ten meetings, and that was back in February 2014. Axelsen looked in great touch during his 21-18 21-14 quarterfinal victory over Chen Long, who had beaten him comprehensively just last week. 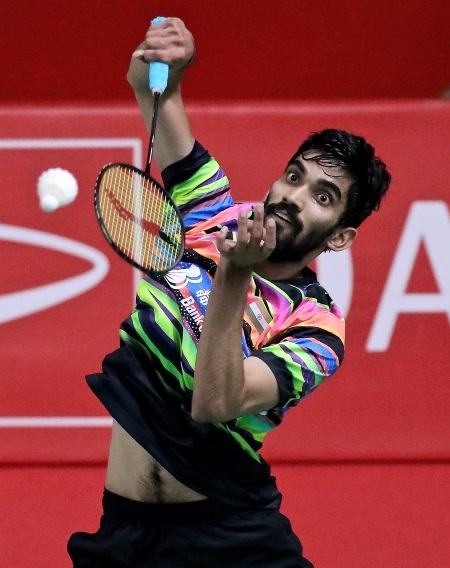 While Ginting fell short, his compatriot Jonatan Christie kept up the Indonesian challenge in men’s singles with another high-intensity performance, getting the better of India’s Kidambi Srikanth, 21-18 21-19. To his credit, Kidambi stayed alive even in the face of Christie’s fiery attack. The Indian pegged away at Christie’s lead until it was 19-all in the second. At this point the Indonesian unleashed an unreturnable smash from deep in his court, and then converted his first match point. Christie faces Denmark’s Anders Antonsen, who eased to a 21-13 21-13 victory over Malaysia’s Lee Zii Jia. Hosts Indonesia had a great day overall, with Ginting’s the only loss. Men’s doubles top seeds Marcus Fernaldi Gideon/Kevin Sanjaya Sukamuljo had a narrow shave against compatriots Fajar Alfian/Muhammad Rian Ardianto, while eighth seeds Mohammad Ahsan/Hendra Setiawan whipped world champions Li Junhui/Liu Yuchen 21-16 21-12 to raise the prospect of an all-Indonesian final. 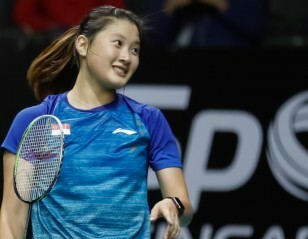 Women’s doubles fourth seeds Greysia Polii/Apriyani Rahayu ground out an 80-minute win over Thailand’s Jongkolphan Kititharakul/Rawinda Prajongjai to earn a last-four place against the pair they beat last week – Japan’s Misaki Matsutomo/Ayaka Takahashi. In mixed doubles, Tontowi Ahmad/Liliyana Natsir motored on, taking just 34 minutes against Japan’s Takuro Hoki/Wakana Nagahara, and getting to within two victories of a dream send-off for the retiring Natsir. 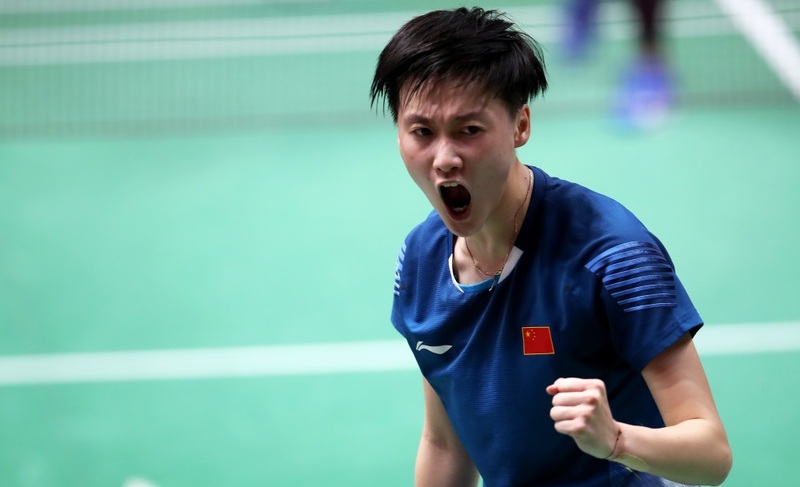 Their opponents will be the pair they vanquished in the Rio Olympics final, Malaysia’s Chan Peng Soon/Goh Liu Ying, while the top half features world champions Zheng Siwei/Huang Yaqiong against Japan’s Yuta Watanabe/Arisa Higashino. Last week’s Malaysia Masters champion Ratchanok Intanon (Thailand) fell to China’s Chen Yufei for the eighth time in ten matches. Chen will hope to repeat her Fuzhou China Open victory over Carolina Marin as the two clash in tomorrow’s semifinal. 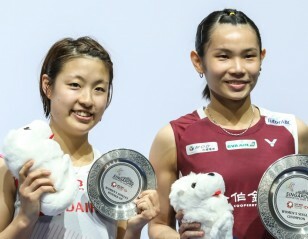 Marin was her pacy best against familiar rival Pusarla V Sindhu, giving the Indian little chance in a 21-11 21-12 rout.